...a major reference work for serious traders who seek to harness the immense value and reliability of seasonals. 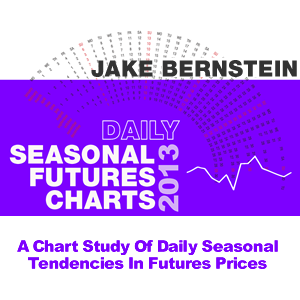 A Chart Study of Daily Seasonal Tendencies in Futures Prices ...a major reference work for serious traders who seek to harness the immense value and reliability of seasonals... Here's exactly what each Daily Seasonal Futures Chart tells you: Daily percentage of time UP or DOWN by exact calendar date: Priceless information Average daily seasonal price trend plot: Tells you the ideal daily seasonal Exact calendar date of average seasonal high and low: Often-uncanny accuracy Covers all active US futures markets Each chart shows the most active period of the specific futures delivery month The most active contract High percentage of time UP and DOWN moves highlighted: Makes it easy to use Covers months included for each market 446 pages in all -- covers every day of the year for every active market Complete explanations and instructions to help you get the most out of the charts INDEXED AND DELIVERED TO YOU IN PDF FORMAT BY EMAIL!